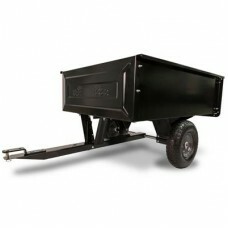 Utility Dump Cart has been designed for easy use with Lawnflite Tractors and Ride-On Mowers. The dump cart comes with a 350lbs load capacity and also benefits from reinforced tailgate, easy single lever release dump mechanism and 13" pneumatic tyres. * Bed Capacity (Heaped): 10 Cu. Ft.